FISCHER AUCTION CO. INC. - Repo, Bankruptcy & Industrial Auction Center » SIGN SHOP INVENTORY LIQUIDATION- ONLINE ONLY ! ! ! SIGN SHOP INVENTORY LIQUIDATION- ONLINE ONLY ! ! ! BIDDER IS RESPONSIBLE FOR REMOVAL AND TRANSPORT.. NO FORKLIFT, LABOR, TOOLS OR LADDERS ON SITE! BRING HELP FOR LOADING IF NEEDED ! ! ! Payment Instructions: All accounts must be settled at the conclusion of the auction. We accept Visa, Master Card/ American Express Credit Cards ONLY. Your credit card will be charged for your purchases, plus buyer premiums, and any taxes. A pre-auction authorization will be performed to establish available credit. NOTHING will be charged to your card until a purchase is made. Credit card charge backs will not be accepted. A $25 service fee will be charged to any account who's credit card on file is declined requiring additional time and telephone contact to establish payment for merchandise or shipping. PLEASE NOTE!! Cash payments will only be accepted until 2:00 pm on the day following the auction. If payment is not received by 2:00 pm, your credit card will be charged. Cash payments must be received at our office located at 1666 N Magnolia Ave Ste. A,, El Cajon, CA 92020. 15% internet buyer's premium. 8% sales tax will be charged unless a California Resale # is provided before bidding (no exceptions) YOU ARE RESPONSIBLE FOR TAKE DOWN/PACKAGING/SHIPPING ARRANGEMENTS AND COST. ALL ITEMS NEED TO BE REMOVED BY CHECK OUT DATES - NO REFUNDS ON ANY ITEMS LEFT AT SITE. - Buyers are expected to exercise due diligence before deciding whether or not to bid. We will provide as much information as is made available to us, but all auction items are sold on a 'where is - as is' basis. Absolutely NO CHARGEBACKS! Previously used for Skate Board Decks. Includes Conveyor Belt, Automatic Take-Off System, UV Dryer and Transformer. ***THIS ITEM IS EXTREMELY LARGE*** Includes Spec. Documents and Operation Manuals. Table size Approx 47 in. x 55 in. Print Size Approx. 36 in. x 49 in. Belt Size Approx. 47 in. x 165 in. Your bid is between increments. Type Folder: Air Feed, Bottom Feed Maximum Sheet SizePparallel: 14in. x 20in. Maximum Size Fold ? 1 or 2 plate: 13.5in. Feeder Pile Height: 2in. You've been outbid by v****y! by YOU! 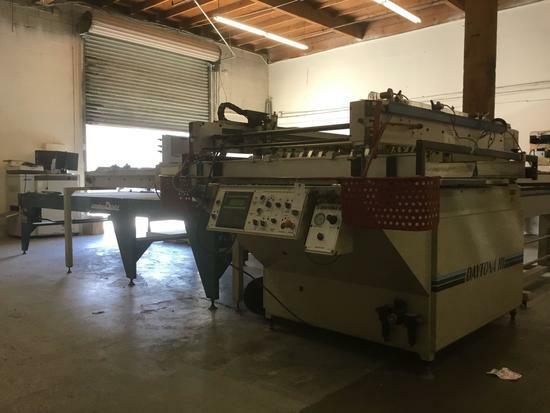 ISP Stitch'n Fold And Plockmatic 310plus Collatorpro. Stitch and Fold Model #B2000. Collator Model #310BPLUS. You've been outbid by j****r! by YOU! You've been outbid by j****1! by YOU! You've been outbid by 0****0! by YOU! Includes Computer System, Scanner and Assorted Cables/Cords. You've been outbid by h****2! by YOU! Includes Xerox EX700 Digital Color Press Fiery Server PRO80-05, Keyboard, Mouse, Assorted Toners, Assorted Manuals and Cables. You've been outbid by C****e! by YOU! You've been outbid by a****n! by YOU! Includes Cables and Boxes of Assorted Metal and Plastic Binding Coil. You've been outbid by r****r! by YOU!